- Christophe Chalençon is the spokesperson for the Vaucluse department. Presenting himself as “apolitical” and “not belonging to any trade union,” he nevertheless presented his candidacy for the 2017 legislative election as a member of the “diverse right.” When we dig deeper into his personal relations and Facebook profile, we can see that his discourse is clearly conservative, nationalist, and xenophobic. - In Limoges, the organizer of the November 17 action of the “yellow vests” in the region was Christophe Lechevallier. Once again, the profile of this “angry citizen” is quite interesting. The least we can say is that Christophe Lechevallier seems to be a turncoat. In 2012, he presented his candidacy for the legislative elections as a member of a centrist party (the MoDem). Then he joined the extreme-right Front National (now called the Rassemblement National) and invited in 2016 its leader Marine Le Pen to a meeting. In the meantime, he was also working with the French pro-GMO agricultural organization FNSEA (the National Federation of Agricultural Holders’ Unions), known for defending the use of chemicals, such as the Glyphosate, to intensify their productions. - In Toulouse, the “yellow vest” spokesperson is Benjamin Cauchy. This young executive has been interviewed several times on national and local media. Again, this spokesperson is hardly “apolitical” if we consider his past. Benjamin Cauchy speaks freely about his political experience as a member of the traditional neoliberal right (at that time, the UMP, now known as Les Républicains). However, during law school, Benjamin Cauchy was one of the leaders of the student union UNI—well-known for its connections with conservative right and far-right parties and groups. But even more interesting, Benjamin Cauchy has not publicly acknowledged that he is now a member of the nationalist party Debout La France, whose leader, Nicolas Dupont-Aignan, made an alliance with Marine Le Pen (of the Rassemblement National) during the second round of the last presidential election in hopes of defeating Macron. - The yellow vest movement claims to be “apolitical.” By and large, the participants describe themselves as disgruntled citizens who work hard but are always the first to suffer from taxes and government decisions. This discourse has a lot in common with the Poujadisme movement of the 1950s, a reactionary and populist movement named for deputy Pierre Poujade, or, more recently, with the “Bonnets rouges” movement (the “red beanies”). - The idea that the movement is “apolitical” is dangerous in that it offers a perfect opportunity for far-right organizers, populists, and fascists to insinuate themselves among protesters. In other words, this movement offers the far right a chance to restructure itself and regain power. - As soon as the movement gained widespread attention, extreme-right politician Marine Le Pen and other conservatives and populists expressed support for it. So much for the talk about being “apolitical”! - This appears to be a genuinely spontaneous and decentralized movement involving low-income people. In theory, we should be organizing alongside them in order to fight capitalism and state oppression. Mind you, the concepts of class war and anti-capitalism are far from being accepted or promoted among the demonstrators. - Some argue that we should participating in order to prevent fascists from coopting the movement and the anger it represents. Some radicals believe that we should take part in these actions as a way to make new connections with people and spread our ideas about capitalism and how to respond to the economic crisis. - For some radicals, being skeptical of the current movement and not wanting to take part in it can also indicate some sort of class contempt directed at the “apolitical” poor. Others argue that in every situation, we should always aim to be actors rather than spectators. Some even assert that if we are “true” revolutionaries, we should leap into the unknown and discover what is possible instead of passively criticizing from a distance. Above all, we need an anti-capitalist, anti-fascist, anti-sexist and ecological front within the space of social movements. The question is whether that should take place inside the “yellow vest” movement, or against it. Clearly, neoliberal capitalism offers no solutions to climate change except to place even more pressure on the poor; but when the anger of the poor is translated into reactionary consumer outrage, that opens ominous opportunities for the far right. Further discussion on the Dialectical Delinquents site here and here. Thanks for the links R Totale. The news of opposition page on the Dialectical Delinquents site is always worth checking. A contradictory movement, reflecting its "interclass" nature, and very vulnerable to populist demagogy. Was thinking of writing something up Friday but didn't, still don't, know much. I went on Paris-luttes and the article they had was one calling for witness submissions to help them work out what was going on. My first thought was astroturf, like the fuel protests in the UK (about 15 years ago) where it turned out that the fuel companies shut everything down, citing safety, in order to pressure the government. It seems wider than that, but hard to say. Media has been saying that protests have been infiltrated by right and left wing extremists since last week. Until this wekend police were saying right wing. 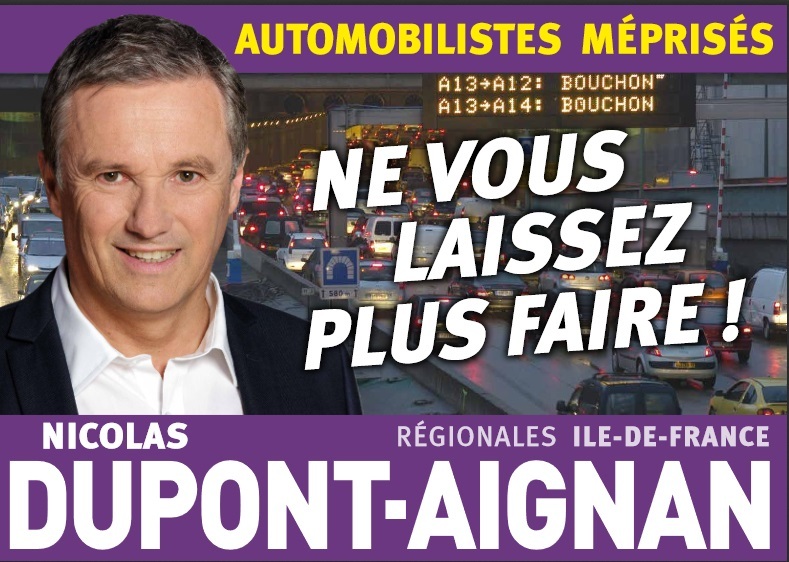 Dupont-Aignan has been trying to gain power off motorists for years, this is his poster from 2015 (he seems to bring out pretty much the same one every time, now it has a Marianne on it. Don't let them push you around any more"
I'm happy they are trashing rich areas, I'm sick of poor areas getting smashed up, because real people actually suffer and things don't get fixed. Although it has spreade to the suburbs. MAcron is going after everyone except the ultra rich so there is potential for something radical, but also for right-wing populaism, and the latter is one of the biggest political movements in the country. Guardian journalist is shocked by the violence, before basically admitting that the only reason this seems so shocking is because usually damage is confined to poor areas. Police have been, apparently, especially aggresive, but then again this is being reported by people who are normally happy to see protesters get a kicking, so hard to say if it is the case. As it does seem like many of these protesters are not used to protesting that could explain their reaction. Police in France start throwing tear gas as their first move, they don't even ask you to disperse, supposedly this was the reason England fans ended up fighting with them too, because they took being attacked with tear gas as an aggressive act. There are a majority of workers, active, unemployed, etc., involved in the "gilets jaunes" but that doesn't make this any sort of vehicle for proletarian struggle - on the contrary. It is, as a post says elsewhere, a "real popular movement", a popular movement where, despite its numerical superiority, the working class is melted into "the people of France", "citizens" who want their "voices heard" and they are immersed in flag-waving, anthem-singing (the hymn of the killers of the Paris Commune) patriotism. Side-by-side the workers stand with small business people, entrepreneurs, the self-employed and thus diluted into the amorphous mass of "the people" will find it impossible to fight on their own grounds. Fertile ground for the far-right of course and the movement has been warmly welcomed by Marine Le Pen ("a legitimate protest") and all the usual suspects looking for assets to manoeuvre in preparation for the anti-Macron forces when the electoral circus comes round again. But it's not just the far-right that's talking up this wave of protest but those defenders of nationalism par excellence, the left and extreme-left of capital who, despite their concern about the "fascists" involved nevertheless see this inter-classist dead-end as something to build on. But nothing proletarian can be built on this sort of basis, on these shifting, diluted grounds. There's no doubt that the driving force of this movement is the increasing attacks on the working class and the population in general but the very nature of this movement, that of the "French people", is weighted against any genuine expression of workers' struggle: solidarity, strikes and general assemblies. That's why it's easily supported by most elements of the French bourgeoisie from the right to the left. Do you think the content of the movement has changed at all as things have developed? I notice that ICC text was written on November 25th, it feels like things have changed quite a bit since then. I don't think that very much has altered, certainly not fundamentally, in the inter-classist nature of the "gilets jaunes" movement over the last fortnight. One element that some has picked up on and have seen as positive in the movement is the absence of the trade unions. While the latter have been sidelined this hasn't happened because the working class, as a class, has taken things into its own hands and pushed the unions to one side - an essential for any developing struggle of substance of the workers. The unions have been sidelined because the workers have become fed-up with pointless "days of action" and being marched up and down in relentless, sterile ad sectoral union manoeuvres. This hasn't translated into the autonomous struggle of the workers but in the petty-bourgeoisie and various state actors filling the void. Seeing the working class reduced to atomised, individual citizens taken in tow by the nationalist aspirations of the petty-bourgeoisie is not a pretty sight, but it does reflect the present stage of the weakness of the working class and is also a result of it. The unions won't be long in stepping up their dirty work and, around Act IV of the "gilets jaunes", are preparing their forces. 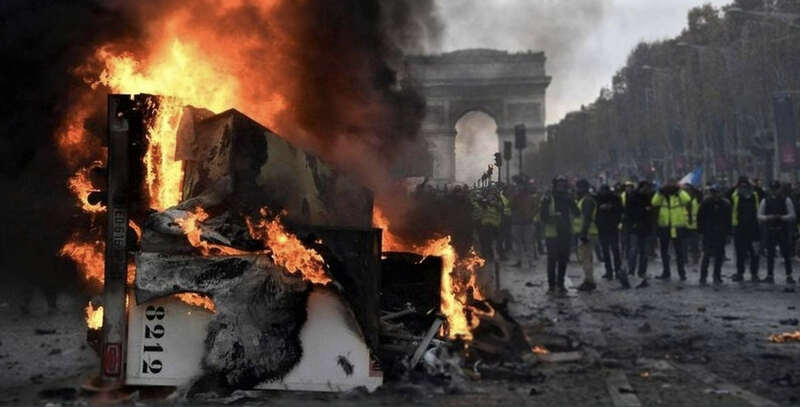 Egged on by the left and leftism calling for the union "leadership" of the movement, the unions seem to be swinging behind the "gilets jaunes" while organising new "days of action" and energy sector strikes next Thursday. The workers, who have so far not shown any real methods of proletarian struggle - autonomous, self-organised and generalising - now face a twin attack from the petty-bourgeoisie on one side and the state's trade unions on the other. Never say never, but it's unlikely that in its present stage of weakness and disorientation and with its enemies attacking it on every side, that the workers can find a way to impose itself as a class. "...The unions won't be long in stepping up their dirty work..."
CGT trade union on Thursday called on its energy industry workers to walk out for 48 hours from 13 December, saying it wanted to join forces with the gilets jaunes. Haha! Verily, you speak sooth, sire! Any reports on the student movement which seems to be gaining momentum? There seems to be conflicting ideas on this last point, perhaps understandably, as I think there's been some yellow vests supporting the student demos? It is, as a post says elsewhere, a "real popular movement", a popular movement where, despite its numerical superiority, the working class is melted into "the people of France", "citizens" who want their "voices heard" and they are immersed in flag-waving, anthem-singing (the hymn of the killers of the Paris Commune) patriotism. The student demands aren't about the wealth tax/fuel tax but about some kind of new education reform which I can't remember the details of. I don't think I can find it now, but there was a yellow vests protest where they all kneeled in front of the police in solidarity with the school students. That was I think Thursday last week (06/12/18). Over the last few days I've seen other protests where participants (especially high school and university students) have knelt before the CRS with their hands behind their heads for a few minutes - I'm going to say, mocking them. If students are coming to protest student debt and are staying to protest police brutality, that to me says 'fusion of the economic and political demands'. I think what we are seeing is some students actually being radicalised before our our eyes. This video (hope this works) is from a camera crew (from RT? Or used by RT? I certainly saw the same footage, maybe RT just streamed it) in a student protest on, I believe, Tuesday 10th December - at several points they do the 'arrested' thing. This recent leaflet by Mouvement Communiste sees the GJ as potential precursor to a fascist mobilization and calls them "objective props" of the state and capital. It does not seem to mention some interesting developments outside Paris, e.g., the blockade of an Amazon warehouse (workers joined by GJ protesters) or the call by port workers in Saint-Nazaire. I'm sure there are problems and ambiguities and of course this is only one bit of a demo, but it doesn't look like it would necessarily be a happy hunting ground for 'sovereigntists'. Wow, that MC leaflet has some really bad bits in, proper ultra-left broom army stuff. I guess people who're really caught up in the role of expert theoretician can have a hard time dealing with amiguity. The exercise of autonomous force by the workers has nothing in common with the spectacle of the devastation of abstract territories of production and social reproduction. City centres are a tremendous backdrop for television and the internet but they are totally opaque and disembodied when it is a matter of hitting the value chain of capital. The looting and damage caused to these opulent town centres are acts foreign to and sometimes even hostile to the hundreds of thousands of workers, most often poor, who are exploited there. The protagonists of these violent actions act as warriors against the future offensive struggles of the proletariat, against its autonomy, against its struggle against exploitation and oppression. They must be considered as auxiliaries of the armed forces of the bourgeoisie and the objective props of capital's order and its state. MC appear to say here that these events are reactionary, not due to the political involvement of anti-working class right elements and/or bourgeois demands - but because riots, looting and clashes with cops in consumer shopping areas are in themselves always anti-proletarian. Clashes with cops apparently even make them “auxiliaries of the armed forces of the bourgeoisie”. After having claimed that the looting & property damage are "alien" to the hundreds of thousands of poor workers employed in shopping/tourist zones the next paragraph then states that proletarian struggles must "root themselves in production and social reproduction". Well, MC already acknowledged that the centres are a workplace for "hundreds of thousands of often poor workers" and obviously consumption/shopping is an integral part of social reproduction – but then they claim they’re totally disconnected from the “the value chain of capital”?? A real mess of an article, seemingly based on a 'noble, deserving factory worker poor versus undeserving lumpen poor' 19thC mentality unfortunately all too often invoked by some left comms/marxists. If movements don't emerge in their prescribed forms they just don't compute and so will be woodenly dismissed. MC write as if the views expressed on the street are inevitably “alien” to their proletarian stereotype. Yet one can see, eg, from a far more sober & nuanced article http://libcom.org/blog/gilets-jaunes-seen-my-workplace-13122018 describing the existence of far-right views among the author’s fellow workers that MC’s idealised proletarian workplace is surely not always free of yellow vest/far right views. Even if it is fundamentally an inter-class movement it deserves deeper consideration than mechanical knee-jerk reaction. The other side of the coin seems to be some ridiculously over-excited insurrectionist/communisation-influenced texts claiming events are already on the brink of total revolution. Which is how they always want to see the latest riot, despite the fact that in recent decades rioting has broken out on a massive scale and then disappeared leaving no sustained movement nor acted as an obstacle to continued attacks on working class conditions; eg, LA 1992, UK 2011. Yet, for communisationists, 2011 was supposedly proof of the emergence of The Era Of Riots. Proletarian defeat has intensified but there’s been barely a whisper of a riot in the UK since 2011, so where did that grandiose penetrating analysis go? The article http://fr.internationalism.org/content/9806/repression-policiere-contre-gilets-jaunes-lordre-va-t-il-regner-a-paris points this out, while noting that "The demonstrations of the high school students all across France (without gilet jaunes, Tricolore or national anthem) were - how strange -not given much media attention". School students are protesting, as far as I know, against the parcoursup which means that university entrance will be selective, at the moment it isn't except at the top establishments. Incidentally this isn't quite the democratic measure that it might seem. In most universities large numbers of students fail the first year, so often those who already know what to do pass (because they went to better schools, had tutors, parents who sent them to camps etc) go through and those who didn't fail. Also tuition fees for foreigners have been masively increased from basically nothing to thousands of euros. Haven't read properly yet (or if I have, not since 2005-6), but for comparison here's Mouvement Communiste on the 2005 riots after police killed two people in Clichy-su-bois. This seems marginally better than the one on the Yellow Vests to be honest, although it still seems to be taking quite a workerist line.